Emma Walker is one of the Northern Rivers’ most well-known artists. Her work was displayed on a grand scale at the 2018 Sydney Contemporary Art Fair, where her new collection Surface Immersion filled the Arthouse Gallery booth. Nadine. I want to talk about the fact that you’ve started working on board. Is it because you’d reached the limit of how physically engaged you can be with a canvas? Or is it because the board is so much more resilient, so you can push against it? Emma. It remains … itself. Nadine. Your paintings — would you say they’re landscape-based? To what degree are you driven by a connection to an outer landscape, and to what degree an inner one? Emma. Landscape is very much a part of my work. When somebody asks me, What sort of work do you do? I always bring out the old annoying ‘landscape-based abstraction’, and then I sort of roll my eyes inwardly. Because it’s such a small amount, really, of what I’m doing. In fact, I seem to be deviating further and further from landscape, as such — especially in terms of the Eurocentric version of landscape, the horizon line and upright trees. That sort of landscape is interesting me less and less. But what I continuously love and draw endless inspiration from is the Earth, and what it offers up. Whether it be trees, or trails of ants, or the colour of rocks, or a sensation of walking, or a memory of a tree on a farm. So it’s a combination of many things, I think. And a lot of them are to do with memory and a sense of place, as well as a connection to the materials themselves. So sticks, branches, mud, dirt, foliage — to me these are materials, as are my paint brushes or my charcoal. They’re all kind of interconnected, somehow. So I guess I’m trying to find a way of translating that experience. Nadine. What does abstraction allow you to do that a figurative approach wouldn’t? Emma. Abstraction allows me to investigate things that are not literal. Things that are beneath the surface, things that are not obvious. Things that are felt, intuited. I don’t mind references to the real creeping in, but I don’t like them to be too real. As soon as something starts to look too much like something, I have to leave it alone. If I could identify my main aim — of which there are many — it would be to try to evoke something. Evoke a quality of something, an essence of something, a feeling of something or somewhere. Or even just the feeling of a particular idea — or how that idea plays out within me. It is abstract stuff, so figuration just doesn’t seem to make sense to me as a means of expressing these very nebulous notions … I get something different when I look at figurative or representational work to what I get when I look at abstraction. With abstraction I feel more. I am a feeling person — as you commented previously — and I guess that’s what I want to feel in my own works, and perhaps what I want to give others when they view my work. Nadine. 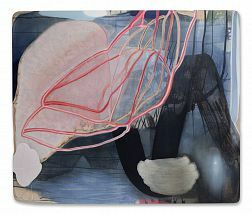 As an aside, a painter that I think works like an abstractist in a figurative way is Rene Bolton. Emma. Yes, I agree. Yes, it’s not even his subject matter that we’re looking at. And likewise, Georgio Morandi. There’s a sort of quiet stillness in Rene’s work that reaches through the imagery and almost obliterates it. But at the same time, the simplicity and sparseness of it is part of that beautiful quiet feeling that you receive from looking at those works. So yeah, you’re right — it can be done. Nadine. I see you as a very emotional person. Is painting the survival mechanism? Nadine. Do you get painter’s block? Nadine. Do you lose patience? And if so, how do you find it again? Emma. I’m terribly impatient, but I’m not so impatient with my paintings. I guess I’m now familiar with the processes that I use. And I know that they take time, and I know that they have to go through this sort of undulating wave of struggle and search and discovery, before they’re really satisfying to me. So if I were to give up on the first day, I know I’d be missing out on the good stuff. So it’s not even really a matter of patience anymore, it’s just a matter of knowing how my process works. But it does drive me crazy sometimes, and I do wish sometimes that I could just set up a nice still life and just paint the damn thing, and not have to question and enter this constant territory of unknowing, which can be very confronting and annoying, and hard, quite frankly. It’s not everyone’s cup of tea, working this way. I don’t even know if it’s mine, but I’m stuck with it. Emma. Here is a quote from the current novel I'm reading: “This is the trick to creative work: it requires a slip-state of being, not unlike love. A state in which you are both most yourself and most alive and yet least sure of your own boundaries, and therefore open to everything and everyone outside of you”. This could be a description of me … It's from All That I Am by Anna Funder. Quite a superb book.